Designer labels globally leave no stone unturned to create a unique imagery by updating the windows and keeping up with the latest season. Everything is taken into careful consideration from the colour palette, silhouettes and surface techniques prevalent and the whole look and feel is decided accordingly. However, with every brand following a similar template, the question of exclusivity arises. No wonder designers have started seeking inspiration outside the usual. Owing to the symbiotic relationship between art and fashion with the two constantly overlapping now and then, artist collaborations seem to be the most obvious choice for brands to push the envelope when it comes to window dressing. While a Japanese comic strip and an Italian luxury brand would normally be perceived as different as chalk and cheese, Gucci’s creative director Frida Giannini has proven otherwise by collaborating with the renowned Japanese Manga artist, Hirohiko Araki. The artist has created an exclusive Manga (Japanese comic strip) story that will bring the windows of Gucci’s worldwide designer stores to life. Entitled ‘Jolyne, Fly High with Gucci’, Araki’s Manga tells the adventure of a student who inherits a keepsake from her mother’s Gucci collection. Propelled by the mystery behind her vintage treasure, she embarks on a journey that transcends time. The visual imagery employs an extensive use of Gucci’s iconic Flora pattern that has been reinterpreted in a number of the Spring/ Summer collections’ signature pieces. Uncanny yet extremely sensual, it is interesting to see how the artist has woven the brand’s design aesthetics into his own distinctive art style. The diversity of artistic influence is evident with the windows of the coveted shoe brand Christian Louboutin. For their Fall 2012 display, onlookers were puzzled when they saw an X-ray taking place in the window! Turns out the design team used pulsing sequenced lights and strobes to further amplify the impression of a real X-ray taking place in the windows. Lamps inspired by a vintage surgical lamp that Louboutin himself bought many years ago were positioned in the windows to highlight the individual products. Inspired by the work of Italian artist Benedetta Bonichi, who is notorious for his art imagery comprising hybrid human X-rays, the windows invited customers to explore what lies beneath their soles. By utilising authentic X-rays which were created in a London hospital, the brand was able to capture the hidden details and inner workings of shoes and bags in its Autumn/ Winter 2012 collection. One of Marc Jacobs’ favourite artists, Yayoi Kusama’s polka dots have been a rage internationally with Louis Vuitton giving it a whole new interpretation by dedicating a collection inspired by the legendary artist. 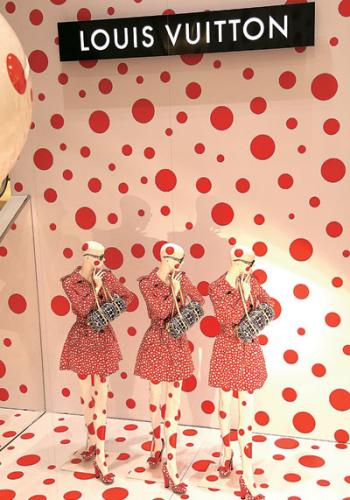 Not just restricting it to their merchandise, the world of Kusama found its way into the brand’s store windows as well as interiors. Reminiscent of Alice’s wonderland, the stores were transformed into art museums with installations and wallpapers engaging the customer at every level. One of the most interesting concepts entitled ‘Self-Obliteration’ features miniature dolls of Kusama in the window which have been made identical to herself, by moulding her face and hands with clay. These dolls representing the artist in her famous red wig and dressed in red and white polka dots will be immersed inside a window also created with red and white polka dots. Passers-by will have to ‘spot’ the Kusama doll hidden among the many dots.